I found this teapot while thrifting a few weeks ago. It's not something that I'd normally be attracted to, and I don't think it really fits with the style (if you can call it that) of anything else in my house. Nor do I need a(nother) teapot. But for whatever reason, it grabbed me that day, and so I grabbed it. 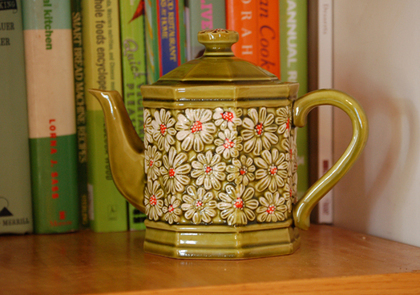 Bizarrely enough, it fit just right on this kitchen shelf, in front of my cookbooks, where even more oddly - it matches the bindings (who knew all my cookbooks were green and orange?!). Sometimes these things just come home and there really is no 'reason.' It just is. Example #2. This, um, ashtray. That I brought home last week, and simply adore. The Mama deer? And all those babes? Pink and brown? C'mon now, who doesn't need an ashtray like this? 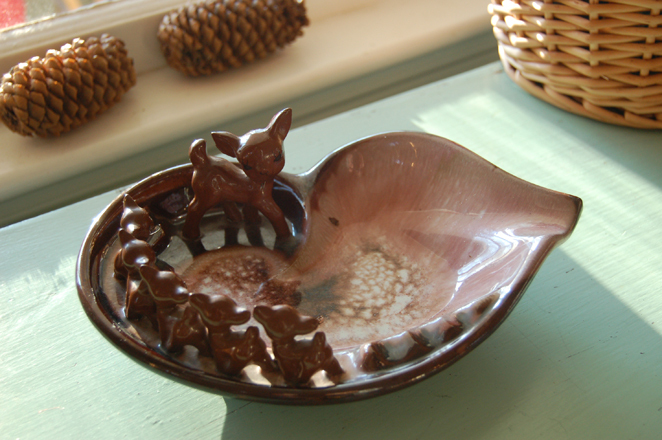 (It's since found a new home as our soap dish. A soap dish! A little gross if you think about it, but I'm just not going to think about it). There's usually a safe bet that in my thrifting bags you'll find some books, maybe some kids clothes, vintage fabric or linens (if I'm lucky), and maybe a dish or two. But sometimes these random little odd treasures are the best surprise of all.